Seeing how they've redone Block E, and the St. Paul Macy's fixing the exterior shouldn't be terribly difficult. What are the chances the mall section is ever torn down and replaced by another tower? Samsung is a huge diversified company with many elements, and this arm of it appears to be an insurance/investment concern. These types of companies commonly buy properties because of the stable income stream that they generate. So, just in case anybody thinks Samsung is going to open up a branch office in Minneapolis, pretty sure that's not what's happening here. To piggy back off of this, the Japanese and Korean economies are dominated by a few massive, dynastic corporations. They touch nearly every segment of the economy. So this is the real estate segment that has nothing to do with the technology they produce. Colliers has a leasing brochure (pdf) up, with an image of the 7th and Nicollet corner. I thought the mural of a Vikings player was interesting. I wonder if the Vikings has any plans? I can't imagine what. Maybe a themed restaurant or experience? Could we start by not having Saks Off 5th lock the 6th & Nicollet door all the time? What is the "Roof Canopy" and "Rooftop Sports Lounge" on the Nic Ave side? Page 9 of the brochure. lol, i didn't even see the fake names in the rendering. I like the glass midblock, I don't like that they kept the chamfer corners. Those spaces are inherently dark and dreary, and it's accentuated by the off-tan concrete (which it looks like they might be thinking of cleaning up, it's hard to tell on a rendering like this). Without something interesting with lighting or street furniture, those corners will remain weak points in the streetscape. I'd much rather they continued the glass along the property line to the corner. I wonder if those chamfered corners were actually an attempt to allow light to cut the corner and prevent shadowing, but clearly they don't work. They say that the shown imagery is by no means final, and it'll be a city variance process and probably summer or fall before construction starts. 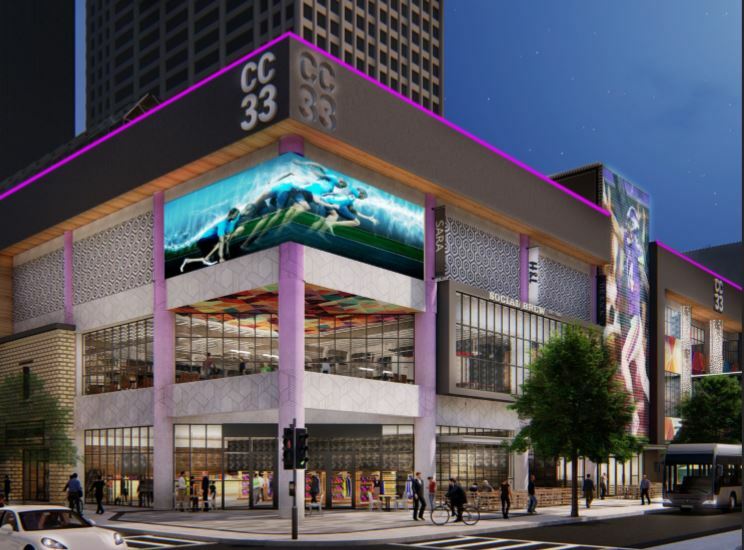 It does confirm that it'll be updating both the Nicollet and Hennepin facades, though.